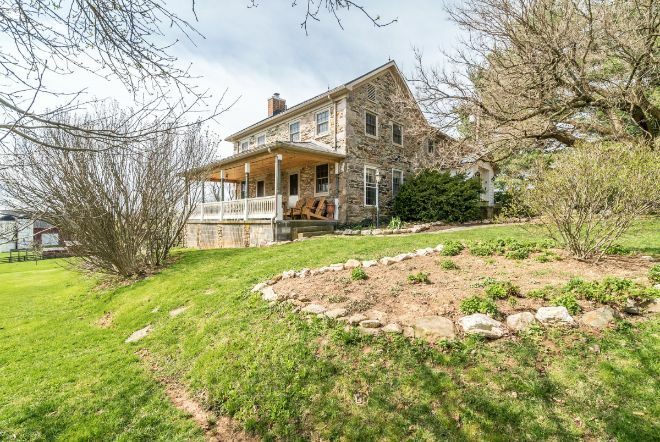 Though modest in its Quaker design, the birth of this historic farmhouse was far more grand. 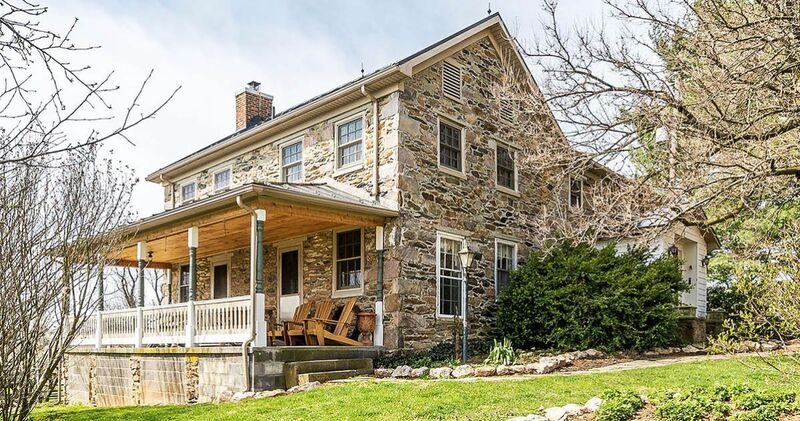 Starting with a royal grant in 1649, the first owners of the land were a Lord and Lady Fairfax of England, whose descendants built this stone farmhouse between 1766 and 1773. 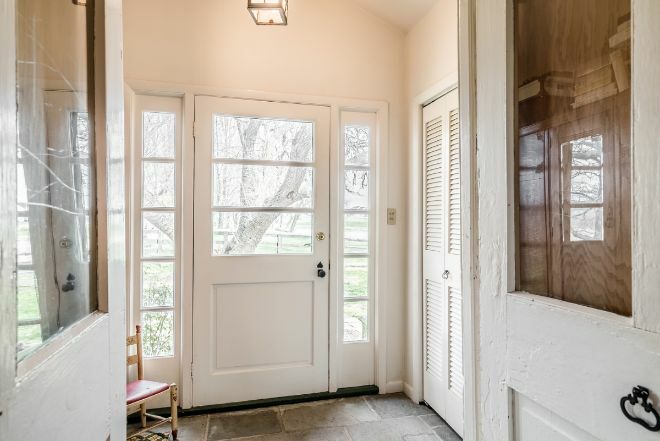 Today, the front door welcomes visitors with a natural stone walkway, meandering around an ancient oak framing the front entrance. Countless children have no doubt scrambled up those branches, to swing their legs and ponder what to do next on a lazy summer day spent on this sprawling country farm. Perhaps they ran around the side of the house where an open porch covers the entire back of the home. 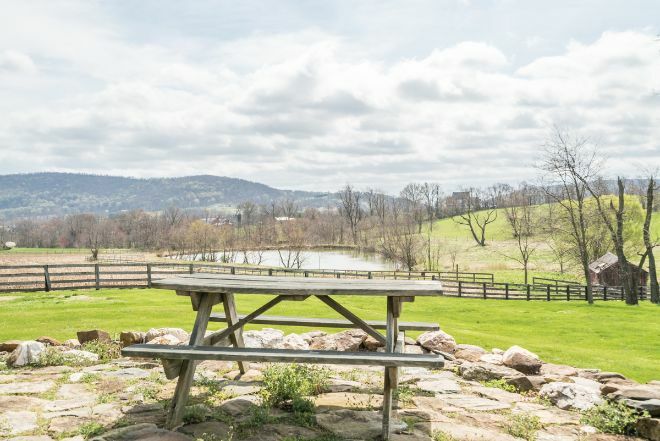 From here, any number of friends and family could be found, finding tranquility as they gaze out over the white railings and take in an authentic country view. 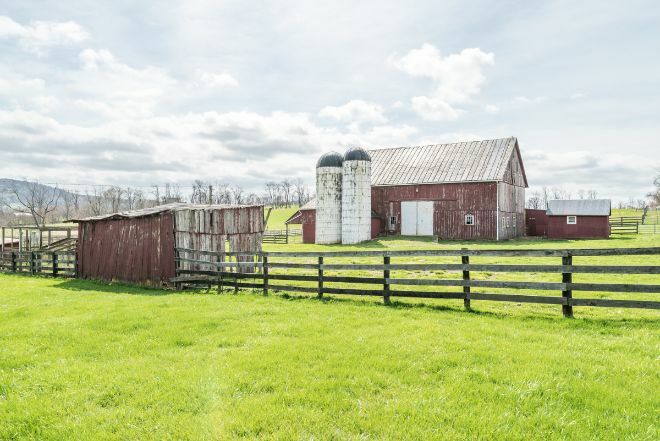 Settling into any number of Adirondack chairs, porch dwellers can relax over a sweeping, downward facing expanse that leads to the currant-red barn and farm lot, where the sight and smell of sweet grasses reaches across the yard. Tumbled native stone that built the home also rims the property as quarried-rock walls which have stood the test of time and the elements. 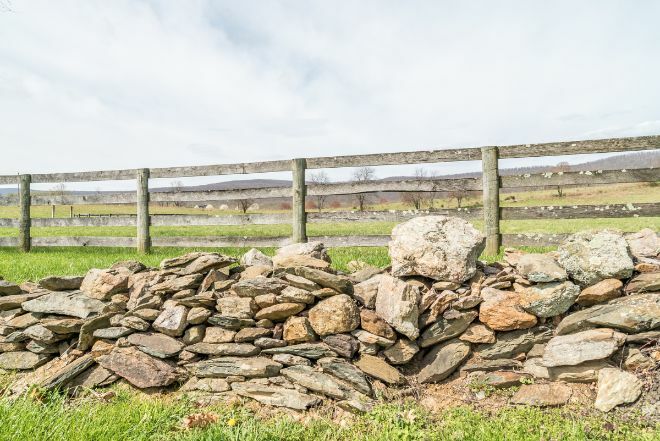 A moss-dotted horse fence just beyond the rock wall rings much of the property and allows plenty of space for riders and their horses. 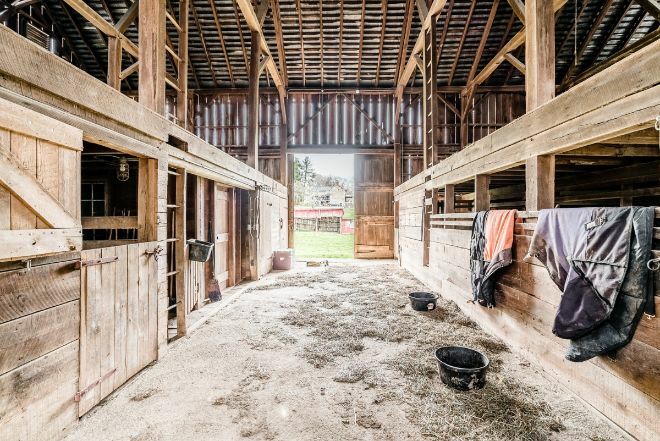 Jennette Taylor, the listing agent of this available property reminds interested buyers to "bring your horses!" A fresh, underground spring feeds the clean-water pond and beckons picnickers to take a country stroll after lunch. The outdoor patio was built with the same stones that grace the house, outbuildings, outcrop sites and other structures. With so much beauty outside, it's not surprising that within all the light-generous rooms, the sights of the farm are not far away. As soon as you walk through the front door, the craftsmanship from long-ago Quaker builders is still evident in the enduring details of cast-iron hardware on well-hung doors. 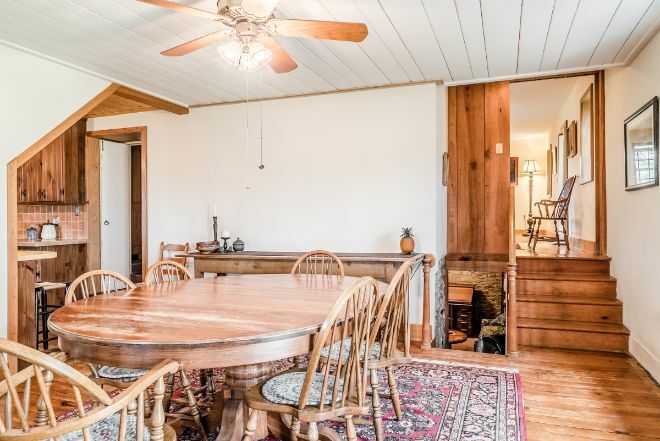 Honey-rich colors in the wide wooden planks ground the bright living room to its distant past. 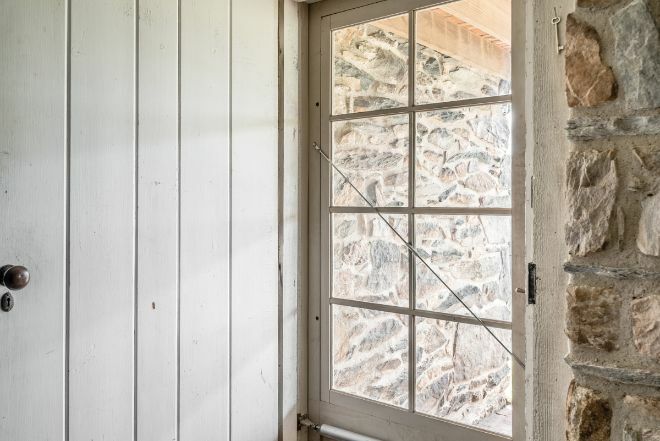 Eighteenth century portraits of young children bookend the deep-set window, which gives evidence to the thick stone walls keeping this farmhouse cozy and secure. 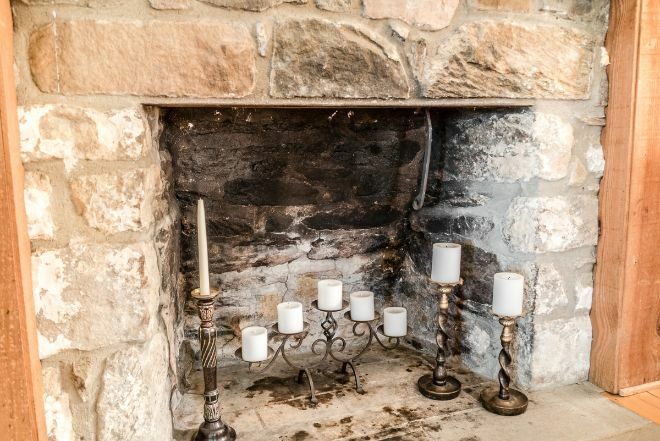 One of three original stone fireplaces, all wood-burning, the time-worn ash creates a rustic backdrop for a romantic, candle-filled space. 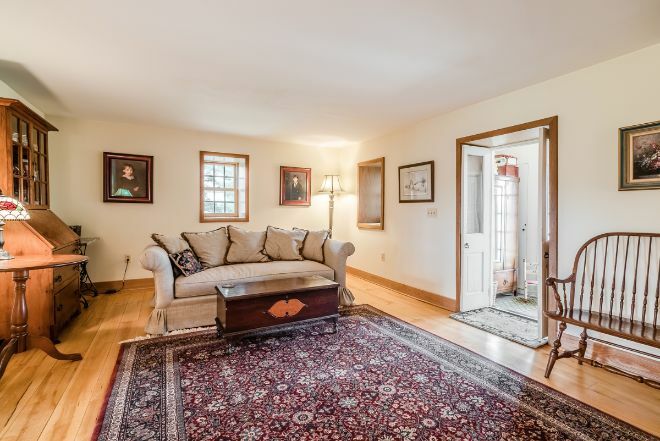 With varying levels, the charm of a peek-through lower cellar and the upper formal living room add charm and show the changing character of the farmhouse kitchen as it moved through time. 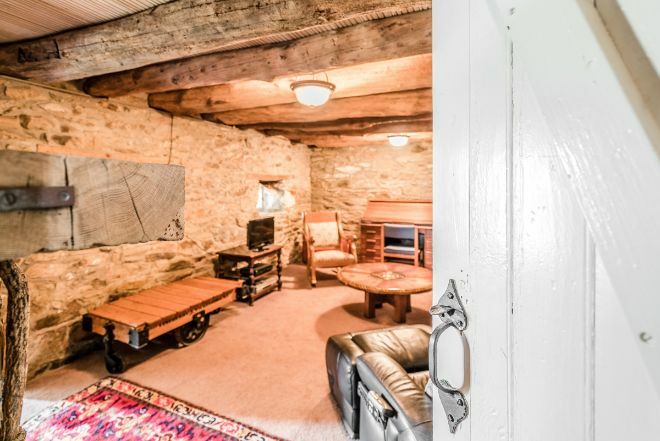 The basement was built from rubble stone, with sturdy hand-hewn beams that match the time-worn charm of the cozy family room. 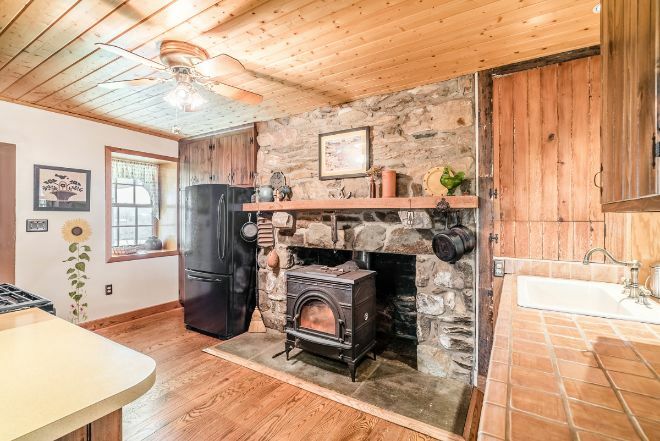 Warming cooks from times past as well as today's modern chefs, the kitchen's wood-burning stove takes center-stage in the large, knotty-pine kitchen. An door leading outside still boasts its skeleton key on a nail hammered above the latch. 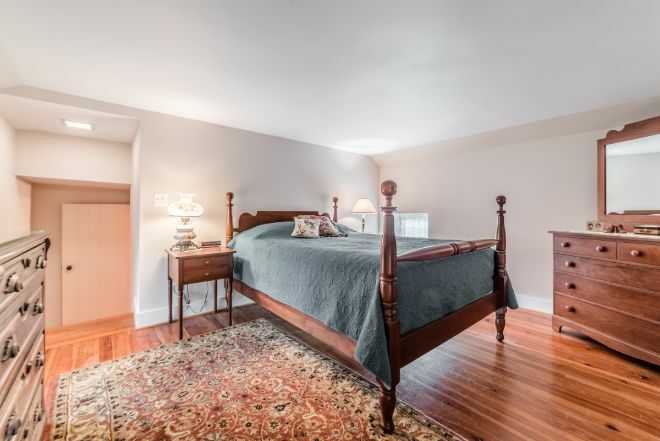 Upstairs, a classic four-poster bed is nestled between two vintage reading lamps. 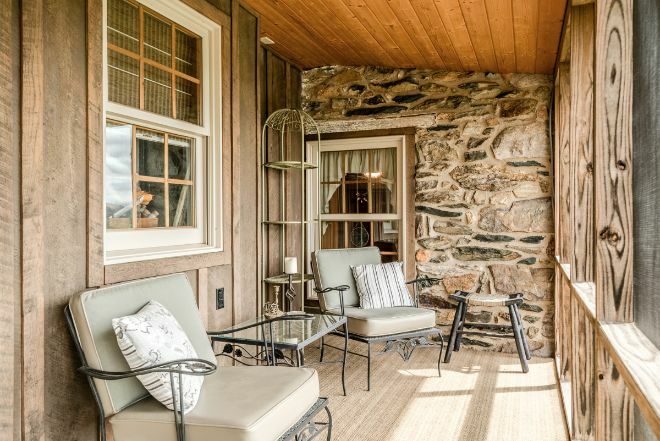 Another porch off to the side combines screened-in comfort with the rustic exterior wall of mix-matched country-quarried stones. A visit to the horse barn is a reminder that time-honored traditions are still a part of country life. Make sure to share this beautiful home with your friends on Facebook!